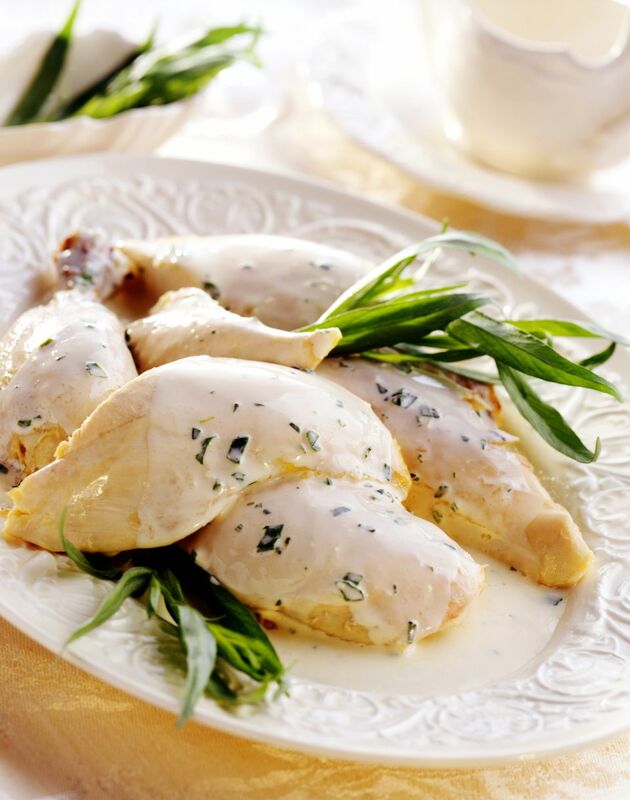 These chicken breasts are cooked with tarragon, chicken broth, a little white wine, and heavy cream. It's a simple recipe, and one the whole family will enjoy. This chicken is delicious with rice or pasta and a salad. Sprinkle chicken breast halves with salt and pepper; dredge with flour. Set aside remaining flour. In a large skillet, heat 3 tablespoons of butter over medium heat. Brown chicken on both sides, Remove chicken; keep warm. Add onion to skillet and sauté for 1 minute. Add wine to skillet; increase heat to high and cook until liquid is almost evaporated, stirring to loosen browned bits on the bottom of the skillet. Reduce heat to medium-low; add reserved flour, stirring to a thick paste. Add tarragon and chicken broth. Return chicken to skillet; cover and cook until tender, about 20 to 25 minutes. Remove chicken breasts to a hot platter. Add remaining butter and heavy cream to the skillet. Heat through; pour creamy tarragon sauce over chicken breasts.